It isn’t uncommon for owner/agencies and general contractors to evaluate the safety record of prospective bidders. This practice can take shape in a number of ways, including reviewing the company’s programs, interviewing staff, using past experience with the company and conducting surveys. However, Dennerlein and his team at Northeastern University, Boston, is working alongside the Center for Construction Research and Training (CPWR) and the National Institute for Occupational Safety and Health (NIOSH) to change that. To Lag or to Lead? Many of the surveys being used to evaluate contractors’ safety use what are known as lagging indicators, such as reporting injuries, past citations from the Occupational Safety and Health Administration, and experience modification rates (EMR). “[Lagging indicators] are problematic in many ways in terms of the construction industry,” Dennerlein said. Not only are they subject to underreporting, but they also ignore a company’s safety culture. Employee training, hazard prevention and control, and management’s commitment to safety, among other factors, are known as leading indicators and can be useful in determining a company’s safety prequalification score. According to Dennerlein, prequalification surveys that account for these leading indicators can improve companies’ commitment to a culture of safety in two ways. First, it sets up a social expectation that a culture of safety will be established. Second, it assesses a company’s existing safety policies, programs and practices. To determine the potential for leading indicators to predict future safety performance, Dennerlein and his team first evaluated the setup and results of existing surveys. They analyzed data from existing surveys completed by more than 2,000 companies to determine the association between leading and lagging indicators. After evaluating these surveys, the team discovered that many surveys were lacking in questions related to worker participation in safety programs, hazard control and evaluation of their safety procedures. The team used this and other research to create its own survey, known as ACES, or Assessment of Contractor Safety, pre-qualification tool. With 77 questions, combining both leading and lagging indicators, the ACES survey aims to give agencies and general contractors a reliable prediction of a company’s safety performance, as well as give the company ideas to improve its safety performance. 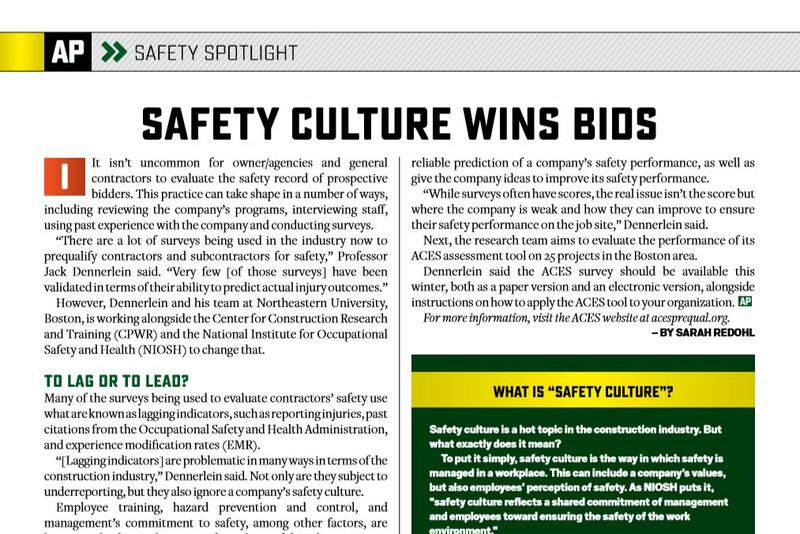 “While surveys often have scores, the real issue isn’t the score but where the company is weak and how they can improve to ensure their safety performance on the job site,” Dennerlein said. Next, the research team aims to evaluate the performance of its ACES assessment tool on 25 projects in the Boston area. Dennerlein said the ACES survey should be available this winter, both as a paper version and an electronic version, alongside instructions on how to apply the ACES tool to your organization. For more information, visit the ACES website at acesprequal.org. Safety culture is a hot topic in the construction industry. But what exactly does it mean? How can you put this somewhat vague, albeit valuable, concept to work in your organization? One first step might be to use CPWR’s Safety Climate Assessment Tool, or S-CAT. Demonstrating that management is committed to safety, i.e., does management participate in company safety audits? Aligning and integrating safety as a value, i.e., how often does the company and its employees discuss safety? Ensuring accountability at all levels, i.e., are safety metrics included in supervisors’ performance evaluations? Improving supervisory leadership, i.e., are supervisors aware of regulatory requirements? Empowering and involving employees, i.e., does the company seek employee feedback on safety conditions? Improving communication, i.e., does the company gather injury and illness data beyond OSHA and other requirements? Offering training at all levels, i.e., does the company offer formal safety training? Encouraging owner/agency involvement, i.e., does the owner/agency understand the safety process? S-CAT goes into great detail with specific examples of each of these indicators in action so you can determine what your company can do to establish a culture of safety. Search “CPWR Safety Climate Assessment Tool” to find and download the S-CAT PDF.